As many of you probably know when Colt designed the Commander model for the Army for use by the officer corp as well as those in support positions this is the gun they designed and it was designed for the 9MM from the start. 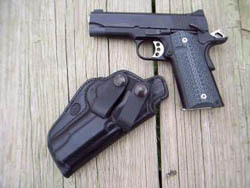 The Colt Commander is 1/4 inch longer than the current trend of CCW 1911’s with 4 inch barrels such as this Kimber Pro Carry II and the Springfield Champion LW and soon (around April 08) the Rock Island Armory Tactical which Armscor calls a midsize gun. 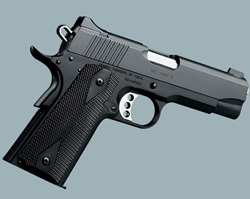 I’m sure if anybody else comes out with another 4 inch 1911 in 9MM it will be Rock Island Armory. They are a very innovative company that pays attention to their customers like no other! This is the only 4 inch bull barrel full frame 1911 I know of in 9MM. The Springfield is available only in 45 with the exception of the smaller 1911 designed around the 9MM. I know who wants a 1911 in 9MM. Well sir, I do. After succumbing to this little beauty I’m a convert. It does fill a useful niche. 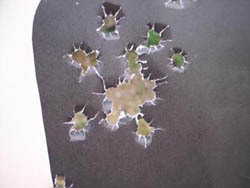 If you’ve read my blog at all you know I’m a 1911 45 ACP devotee in the extreme but lets keep an open mind on this one. No, I’m not getting into the endless 45 ACP vs 9MM debate. I’ll say this–over the last several years ammo makers have come a very long way in making the 9MM a much more effective load than it was even ten years ago. I use the Winchester Ranger “T” series 127 grain +p+ for my Hi Power and now this Kimber. It feeds very well and the ballistics on this round are impressive. I trust this load to do the job simple as that. 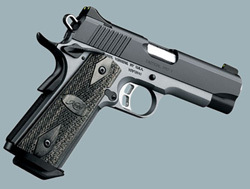 The Kimber holds 9 rounds of 9MM in the magazine with one up the pipe. Weight on this gun with the alloy frame is 28 ounces. So, ten rounds at your disposal in a lightweight highly concealable 1911. What more could you ask for in a daily carry gun that will ride with you eight or ten hours a day. Riding in a Milt Sparks 55BN in winter and a Sparks “Heritage” IWB in warm weather and you’re set. I don’t shoot slow at all from ten yards. I practice like I would if engaging a real target. As you can see this little gun is an excellent natural pointer as most 19111’s are. These first 50 rounds were all ball ammo from Winchester in the white box Wal-Mart variety. Next I loaded up the mags mixing Federal 9BP’s with Cor-Bon 125 Grain +P’s, Speer Gold Dots and some older plain hollowpoints. Everything feed to perfection with all mags no matter how I mixed up the ammo. I fired a total of 200 rounds with no malfunctions. Next I backed up to 25 yards and did some slow fire. I fired 20 rounds from this distance at the head. All rounds were fired standing without a rest. This is the target. Practically speaking you wouldn’t be making head shots at 25 yards but for the sake of testing accuracy it works. I was really impressed with the results. I had two flyers with one a little high and the other a little low left as you can see from the picture. Eleven rounds of the twenty went into the center hole. 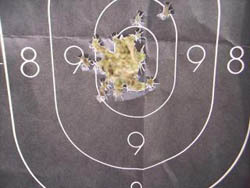 This is a better result than normal for most 1911’s I shoot at that range regardless of caliber. It just proves if you do your job this little gun will shoot up to a high standard. It is fitted with a match barrel and trigger. I loaned out my trigger pull gauge so I can’t tell you the exact trigger pull but it is crisp with little take-up. Since the first time through with the excellent results at the ten yard line I loaded up one mag to capacity and moved back to the ten yard line intending to fire the entire mag as fast as possible. All ten rounds went into the same large hole from the first time through. This really got my attention. To say I was surprised would be an understatement! I’m up to 550 rounds on the Kimber this week with only one problem which has nothing to do with the gun. I felt like I should pass this along so you won’t have the same problem. I was cleaning the Pro Carry and ran out of Wilson gun grease. I made a Wal-Mart run and picked up some “Shooters Choice” all weather high tech gun grease and applied it like I would the Wilson grease. When I went to the range I immediately had malfunction after malfunction of every type you can imagine. I was using the same ammo as before and the same mags. Nothing had changed except I used that shooters choice grease. I tore the gun down and wiped it down removing the grease. I got it pretty dry then just lubed the gun as usual with Militec only. After that there were no more problems of any kind. The problem was obviously the grease. The question now is why? There are two reasons I can think of. The recoil impulse for a 9mm in this gun is not sufficient to overcome the extra drag from the grease. The second would be the grease formulation is just too thick to work well with any gun. No matter—I would stay away from this brand of gun grease period!